The enormity of ‘Trouble in Tibet’ becomes apparent when we remember more than 1.2 million dead under oppressive rule of Red China. Tibetans across the free world, joined by their supporters, marked on Mar 10 the 57th anniversary of their uprising against the Chinese occupation of their homeland with protest rallies, flying of Tibetan national flags from prominent public buildings and private homes, and speeches. (TibetanReview.net, Mar12’16) – Tibetans across the free world, joined by their supporters, marked on Mar 10 the 57th anniversary of their uprising against the Chinese occupation of their homeland with protest rallies, flying of Tibetan national flags from prominent public buildings and private homes, and speeches. They condemned the continued policy of violent repression of the Tibetan people and called on China to resolve the decades-old political issue through dialogue. The day was also marked as Tibetan Martyr’s Day, for the more than 1.2 million Tibetans who died since China began its invasion of Tibet in late 1949, especially the more than 400 who have self-immolated since Feb 2009. In Dharamshala, India, both the executive head of the exile Tibetan administration, Sikyong Lobsang Sangay, and Speaker Penpa Tsering of the Tibetan Parliament in exile, addressed thousands of people at the official function held on the Tsuglakhang courtyard, recounting 57 years of horror endured by Tibetans under China’s subjugation and emphasizing that resolving the issue through dialogue and granting an ethnically contiguous Tibetan territory autonomy under Chinese sovereignty would be mutually beneficial. The official function concluded with a large rally of Tibetans snaking its way to the downtown district court complex area where speeches were delivered. 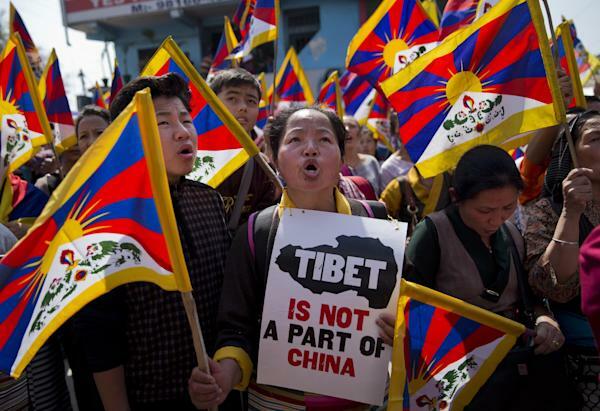 The rally was jointly organized by the National Democratic Party of Tibet, Tibetan Youth Congress, Students for a Free Tibet, GuChuSum Movement and Tibetan Women’s Association. 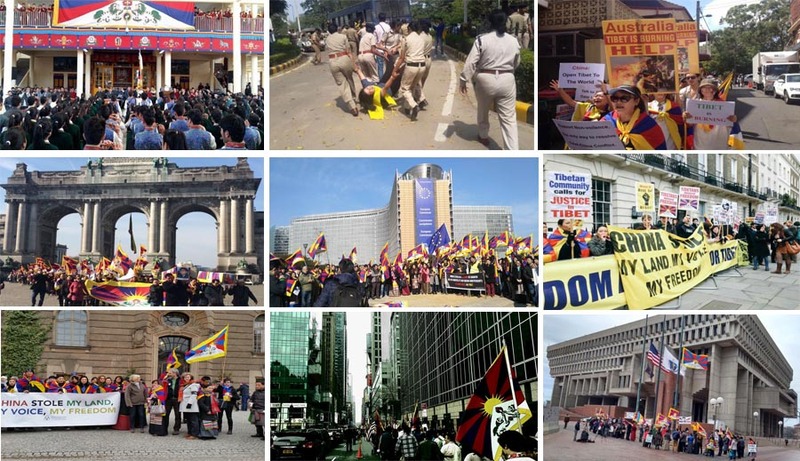 Other commemorative events were held by Tibetans and supporters in cities across the world. 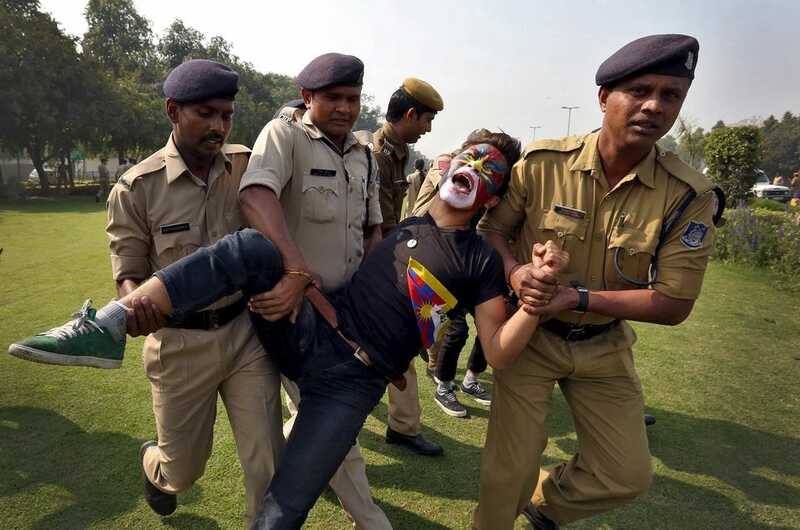 In India’s capital New Delhi, dozens of activists of the Tibetan Youth Congress were detained after they protested outside the Chinese embassy. Many had faces painted with Tibetan national flags, which they also carried in their hands, dressed in black. They shouted slogans such as “China go out” (of Tibet) and “Please support us” before being subdued and taken away in police buses, reported laprensasa.com Mar 10. A much larger protest rally was held at Jantar Mantar, near Connaught Place, with the participation of a large number of Indian supporters as well. In the south Indian IT hub of Bangaluru, around 600 Tibetans held a peace march on the eve of the uprising anniversary, said the laprensasa.com report. Commemoration and protest rallies were also held in numerous other towns and cities in India, both by Tibetans and Indian supporters. A number of online reports also spoke about commemoration functions and protest rallies held in a number of US cities. Democratic Leader Nancy Pelosi and Representative Jim McGovern published an op-ed in the USA Today on Mar 10. Describing their experiences in Tibet which they visited as members of a US congressional delegation in Nov 2015, they called on Chinese authorities to engage the Dalai Lama in dialogue as part of what they describe as a “narrow but real” opportunity for the Chinese government to re-evaluate its policy toward Tibet. In downtown Santa Fe, in New Mexico State, dozens of Tibetans marched from the Tibetan Association of Santa Fe’s center to the state Capitol on Paseo de Peralta where a commemoration function was held, followed by a rally through the streets. There were also media reports of similar events held in Utah, downtown Minneapolis (over 400 people), Ithaca, and numerous other places. In Canada, dozens of people were reported to have gathered in front of Calgary’s city hall on Mar 10 to mark the Tibetan National Uprising Day. Waving the Tibetan flag and holding signs with slogans such as “Human rights in Tibet,” “Allow media in Tibet,” and “Stop torture in Tibet,” the group was reported to have finished their march in front of the Consulate-General of the People’s Republic of China. In Australia, a number of Tibetans had their heads shaved to pay tribute to 18-year-old Kalsang Wangdu and 16-year-old Dorjee Tsering, who had self-immolated the week before in Tibet and in India while commemorating the event in Sydney. 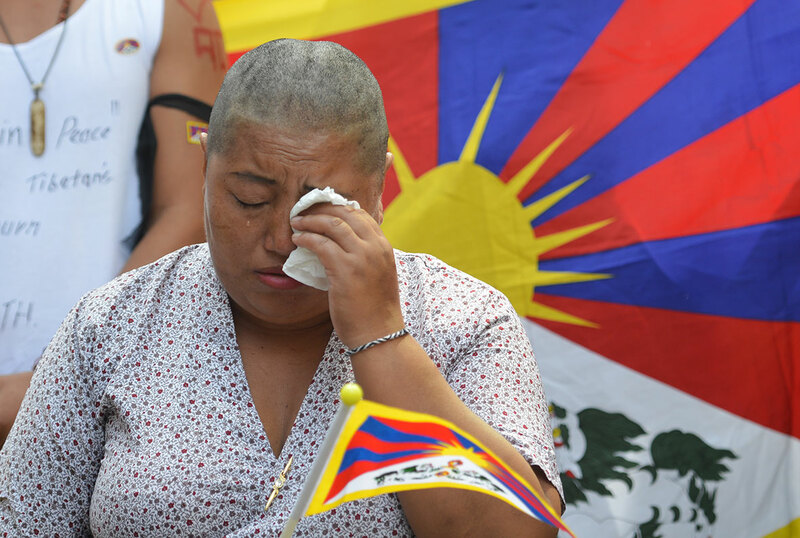 In Brussels, more than 250 Tibetans and European friends gathered in Schuman Square next to the European Commission and Council to commemorate the uprising day. Mr Thomas Mann, a German member of the European Parliament and chair of the Tibet Interest Group, a cross-party group of European Parliamentarians, issued a statement for the occasion. The crowd later marched to the Chinese Embassy, shouting slogans. In UK, protesters gathered opposite the Chinese embassy in London and later marched through central London to the Westminster Cathedral Hall where later in the evening a Tibetan cultural event was held. Tibet Society, UK, called on Prime Minister David Cameron to meet with the Dalai Lama and urged governments to work multi-laterally to solve the Tibet crisis. In France, the Mayor of the 2nd district of Paris, Mr Jacques Boutault, raised the Tibetan national flag in front of the city hall at a commemoration event attended by more than 400 Tibetans and supporters. Senator Andre Gattolin, Vice President of the Tibet Group in the French Senate, was among those who addressed the gathering. The crowd later marched to the Chinese embassy, shouting slogans. In the Czech capital Prague, on a proposal by the Culture Minister Mr Daniel Herman (Christian Democrats, KDU-CSL), the Chamber of Deputies observed a moment of silence in commemoration of the victims of the Chinese invasion and occupation of Tibet. Later in the day, a crowd of about 150 rallied under the theme of Voice for Tibet with playing of Tibetan music and anthem outside the Chinese embassy. One of the banners carried by the protesters said “Czechs Support Tibet”; it featured a portrait of former president Vaclav Havel flanked by Tibetan Dalai Lama, reported praguemonitor.com Mar 11. Members of Parliament of the three Baltic States of Estonia, Latvia and Lithuania joined Tibet supporters in issuing a joint statement, deploring the current situation in Tibet and calling on China to begin immediate and meaningful dialogue with the Dalai Lama and the Tibetan administration in exile, given the fact that both were only seeking meaningful autonomy for Tibet within the People’s Republic of China. In Japan, around 80 Tibetans and Japanese supporters gathered on Mar 6 at Shibuya Miyashita Koen (Park) to commemorate the uprising day. Their marching route was otherwise no available for Mar 10. As the march entered the intersection in front of Shibuya station, famously known as ‘The Scramble’ and referred as the world’s busiest, a statement on the current situation in Tibet and appealing for global intervention there was loudly read out many times. Mr Makino Sensei, former MP and Tibet supporter was among those who addressed the gathering.